Interested in getting into scotch, but feeling a little scared of the manly dirt-tasting brown drink? The makers of Johnnie Walker are here to help! 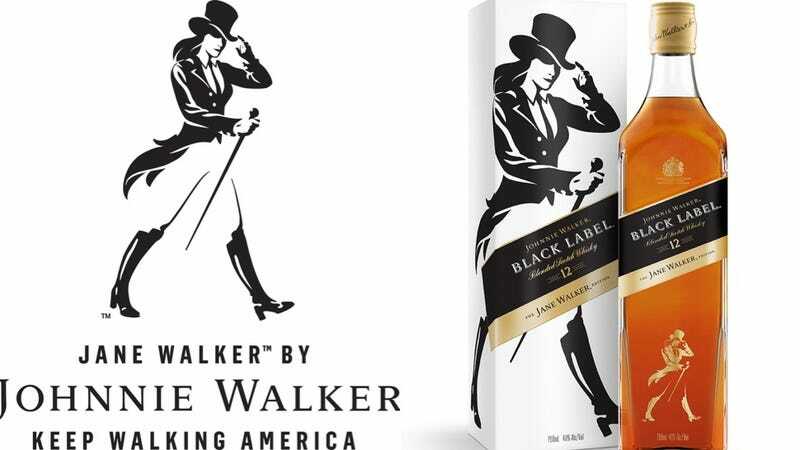 A limited U.S. edition of the whisky will have a striding woman on the label — rather than the traditional top-hatted man — and carry the name Jane Walker. Brand owner Diageo Plc is hoping the move widens the appeal of the product while celebrating women, said Stephanie Jacoby, vice president of Johnnie Walker. Yes, nothing feels as inviting to me, personally, as a logo featuring a lady in jodhpurs and being informed that Scotch is “intimidating” to women. “We really see Jane as the first female iteration of our striding-man icon,” Jacoby told Bloomberg. “We like to think of our striding man and our striding woman as really walking together going forward.” Onward to go shoot some foxes and talk about enclosures, presumably. “For every bottle produced, Diageo is donating a dollar to organizations that promote women, including Monumental Women and She Should Run,” the piece noted. The bottle will retail for $34. The original version of this post included a “Johnnie Walter” rather than a “Johnnie Walker.” We regret the error. Have You Ever Seen a Manlier Photo Than This One for Ryan Reynolds&apos;s Manly New Brand of Gin?